Note: We now recommend the AAV-FLEX-ChR2tdtomato-rev construct. It shows less clumping relative to ChR2 labeled with mCherry. These vectors are prone to recombination. 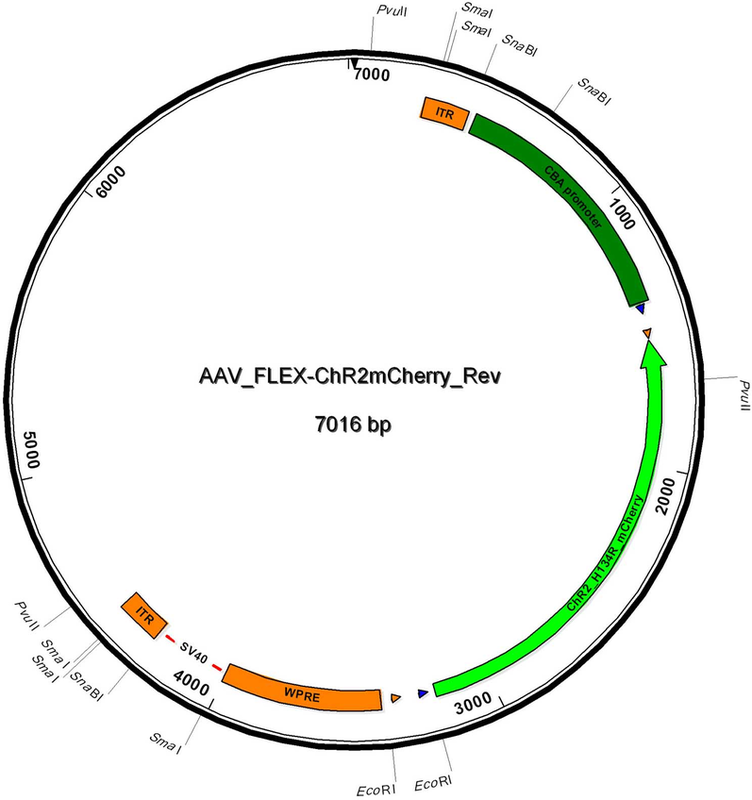 This is a well known issue with these AAV vectors and is due to the inverted terminal repeats (ITRs) required for AAV production. To minimize recombination, we propagate these plasmids in Stbl2 cells from Invitrogen. Also, to minimize recombination, cells should be cultured at 30 C.
Because recombination may still happen occasionally, we do a panel of restriction digestions to assess whether the ITRs are in tact. Separate digestions with PvuII, Sma1, and SnaB1 should be performed. The expected patterns can be calculated from the attached sequence. 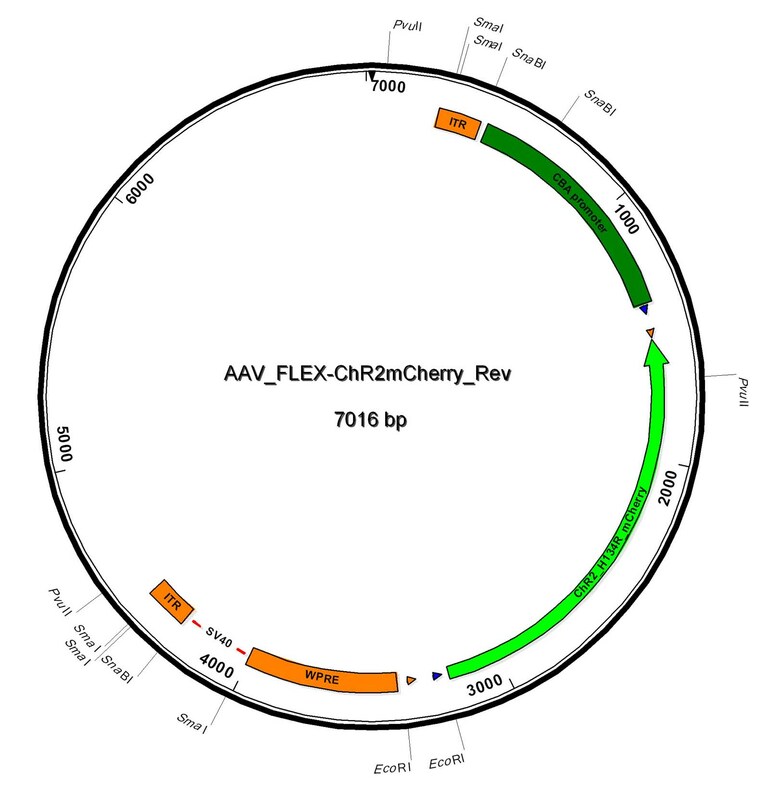 Ready-to-use AAV9 particles produced from AAV-FLEX-rev-ChR2(H134R)-mCherry (#18916). 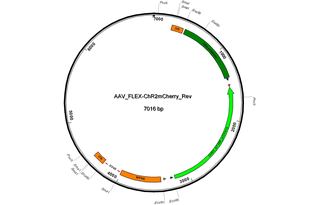 In addition to the viral particles, you will also receive purified AAV-FLEX-rev-ChR2(H134R)-mCherry plasmid DNA. CAG-driven, cre-dependent, humanized channelrhodopsin H134R mutant fused to mCherry for optogenetic activation. These AAV preparations are suitable purity for injection into animals.